So today we had the Sony tech guys come for a visit and bringing them with the new A7, A7r and RX10. 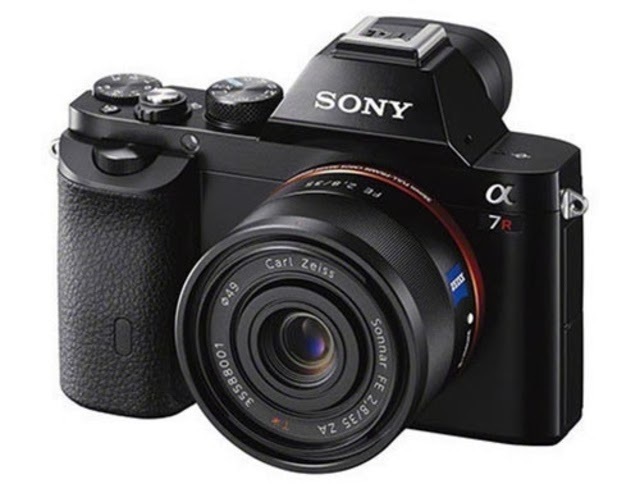 I will concentrate on the A7r as this has been the camera of most interest to me on a personal level. I want a "take everywhere" smaller camera with the best picture quality I can get. Ive been using and loving the RX1r but decided to hang fire on the purchase of it until Id had a chance to have some time with the A7r. Ive been pretty excited to get my hands on it to say the least! I'll keep this reasonably brief and get in to things in more depth when we get out initial shipment next week. Initial impressions were mixed. The build quality seems really pretty good. It has a nice metal feel to it and sits comfortably in the hand. The comments on the position of the shutter release, unfortunately, are true. Just a bit out of position for my fingers and I had to consciously reach back to release it. The RX1r with Ulysses case handles better in my experience. Also on the handling note, the release felt terrible. It has a real dead, disconnected feel which is disappointing. The shutter is loud. I was hoping initial reviews were overstating things but it is very noticeable. Also it has that "slow returning" mirror sound about it which makes it loud and seemingly labored. AF seemed to be also a slight let down. It seemed to want to head out to infinity and then come back which makes it seem slower and worse then my RX1 experiences. Yes, this is a production model. Picture quality as far as resolution goes is sublime. The 35mm is very very good only let down maybe a little in the corners wide open. Stopped down it is stunning and matches the sensor just fine. Bokeh seems good but gets beaten easily by the RX1 which is to be expected. The 55mm is as terrific as well and just a little better which is really saying something. These 2 lenses cant be faulted. But...... Im not sure either have the character that Ive seen and loved in the RX1r. I printed some of the RAW files from both lenses at 30x20 inches in the ZBE Chromira and they are truly stunning. Its all very well pixel peeping but its a different ball game when you see a large print in the flesh. I use a Canon 5D3 with Zeiss and L lenses and I wish wish wish Canon could make sensors this good! They are amazing in both the colour they record and the latitude the raws give you to work with. Simply stunning. So after an initial test its a tough call which way Id go between the A7r and the RX1r. The A7r has the edge in outright picture quality at large size but only just! There is also the ability to grab another lens or 2 down the track but then I would lose sight of what I wanted these cameras for in the first place. The RX1r on the other hand is smaller, silent and in my initial shooting, seems to have more of that Zeiss look. Also shooting @ F2 makes pictures really come alive. Ive linked in some raws for you to have a look and play with. Dont judge the material! It was simply a case of go outside, test wide open and stopped down a bit. Eliminate any chance of camera shake, try and get subject at various areas of the frame and move on. Time was limited. Light was flat and horrible today but the camera did really well. Rx1r is definitely magical and I've never had a serious issue with camera shake there. Also the lens is tiny making the camera so easy to carry. I kept checking last week when I took ot out for a walk. I do crave something for a long reach..so I'll have to think.